On the 2nd of April 2019, PARM in collaboration with the MoA organised a high level workshop to share the final results of the PARM process in Zambia. In Zambia, more than 60% of the population lives in rural areas and relies on agriculture for their livelihood. Agriculture is therefore a key sector for Zambia’s growth and poverty reduction programs. The Government of the Republic of Zambia, in its Vision 2030, prioritized agriculture-led development as a potential driver for economic growth, poverty reduction as well as food and nutrition security. This is also with a view to ensuring that the country’s over-dependence on copper mining is offset. Currently, agriculture’s contribution to the overall Gross Domestic Product (GDP) is significantly low compared to services and industry. Agriculture GDP is also below the Sub-Saharan African average. Besides matters relating to policy reform, investment (public and private), and institutional arrangements, Zambia’s agricultural development is affected by human and naturally induced shocks including: extreme weather events, El Nino and La Nina, occurrence of droughts, dry spells and floods, plant and animal diseases etc. Moreover, risks related to price volatility, trade restrictions, post-harvest losses, low information and technological capacities, etc. also cause negative impacts to agriculture sector growth and pose a challenge to food security and nutrition in the country. For the past years, a number of institutions have placed considerable importance on the agricultural sector in general and more specifically on Agricultural Risk Management (ARM) in the continent and in Zambia. In this context, the MoA has recognized the need to foster the collaboration with the Platform for Agricultural Risk Management (PARM). The general objective of the workshop was to share the results on agricultural risk management in Zambia and to solicit the support of the Government as well as technical and financial partners, to ensure implementation of the agricultural risk management tools identified through the feasibility studies. • Raise awareness among the stakeholders about agricultural risk management policies in Zambia and the country PARM process. • Present and discuss the results of the feasibility studies on i) Enhancing the Zambian Warehouse Receipt Systems (WRSs) and aligning it with the Food Reserve Agency strategic plans and on ii) Improving access to agricultural risk information for meso level stakeholders in Zambia. The discussions will focus on the relevance of the studies and proposed implementation, with the proactive participation of the Government and, technical and financial partners. Those most interested among them will express their willingness to continue the dialogue with the Government and collaborate in the long term on implementation of the tools. • Develop the axes of an action plan including a monitoring system to support the implementation of the identified tools. Ensure that the MoA, partners and stakeholders, take the lead in agricultural risk management at the national level. 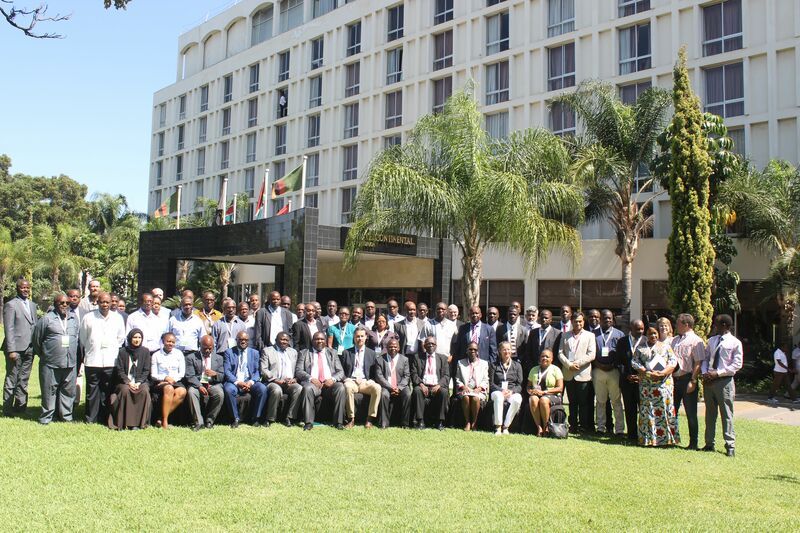 The high level workshop took place at the Intercontinental Hotel in Lusaka. The workshop has counted with the presence and input of the Permanent Secretary, Hon. Songowayo Zyambo, who outlined the Agricultural Risk Management (ARM) initiatives within the MoA and expressed its appreciation for the ARM policy processes facilitated by PARM and NEPAD. Stakeholders, technical experts, policy makers and development partners met to engage in this policy process and in its current two specific proposals on: enhancing the WRS and improving access to information to meso level stakeholders. The tools addressed raised the interest of the government and the technical and financial partners, whom confirmed the relevance of the feasibility studies and the need to put into place synergies to ensure the implementation. The workshop is considered as a milestone for the PARM process in Zambia, as a strong commitment has been expressed by the MoA and institutional arrangements will be made for the integration of ARM into the NAIP II. The workshop also aimed to define the axes of an action plan (and potential strategic partners) including a monitoring framework to support the implementation of the ARM identified tools. PARM will follow-up with the Government to provide technical support when needed to facilitate the implementation of the identified tools and keep working in collaboration with development partners.